There are only a few things Naxos, the largest island of the Cyclades, does not have. It doesn’t have the reputation of a glamorous or ‘romantic’ holiday destination. It doesn’t have large package deal kind of hotels. And it doesn’t have an international airport. Perfect, because this keeps the crowds away. Start with the main town, a charming and lively place with whitewashed houses, narrow alleyways, a Venetian castle, a few museums and art galleries, plenty of shops, cafés and restaurants, and an archaeological site even. Beaches? Some of the best in Greece! The best and largest are on the s/w coast of Naxos – Agios Prokopies, Plaka, Kastraki to name a few – add them all up and you have over 12 km of beautiful sand to spread your towel on. There are a few organised stretches, with sun beds and umbrellas, but most beaches are ‘virgin’, with fine or coarse sand, here and there some trees giving shade, and a crystal clear sea. Even in August, it is always possible to find somewhere quiet. Tradition? Naxos is still the ‘real Greece’. The island is dotted with little villages, and as it has plenty of water and small-scale farms, it produces its own fruits, vegetables and milk products (local cheeses are excellent), and olives of course. You should definitely spend a day going around the island, strolling through some of the villages and stop for lunch or some mezedes on a village square, to get a taste of Greece in its purest form. Nature? Yes! Naxos is a mountainous island with peaks reaching over 900 metres. The inland of Naxos is totally unspoiled (as is most of the coastline) and the opportunities for walking are countless. Old paths and marked trails will take you through mountains and valleys with beautiful wildflowers, streams, small waterfalls, forests, olive groves and vineyards. PS There are some great small hotels in Naxos too! 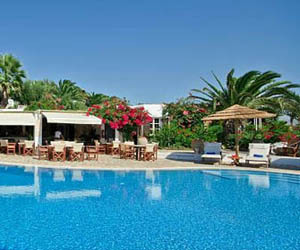 A gorgeous complex of studios and villas on the island of Naxos. A hotel with comfortable accommodation, a beautiful swimming pool, great food, lush gardens, lots of smiles and, nearby, amazing beaches. 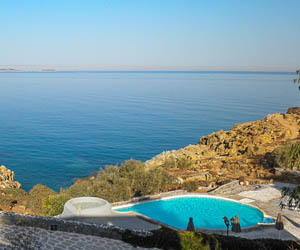 A small hotel right by the sea on Naxos island. Beautiful rooms and suites in a peaceful Cycladic setting, a private beach, a sparkling swimming pool, great comfort, heaps of charm, and excellent food.